CoSpace Foundation, a non-profit organisation has initiated a unique opportunity for Art & Fashion Startups. It is incubating around 50 startups at their Cospace for Art & Fashion startup centre. At their Panampilly Nagar Hub, it provides the emerging designers with co-working and sharing space where the startup designers can showcase their works on fashion, art, craft and other creative projects. It helps them with the necessary marketing support to improve access to the market for their products. As of now, most of the start up designers works at their home and their only way to display and market their products is through the social medias and word of mouth.The inauguration of the startup centre was made by Smt B Bhadra, Dy. Mayor of Cochin on 31st October. Speaking at the occasion, she congratulated the organisers for bringing up such an idea which was heard of till now only in the IT field. 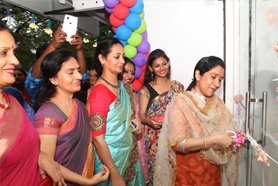 Inauguration of the Cospace showroom at Panampilly Nagar was done by Smt Sujatha, theplayback singer. The showroom offers for sale a great collection of Boutique products by several emerging designers.Along with this, a Women's Empowerment Hub (WeHuB) was also opened by Smt. 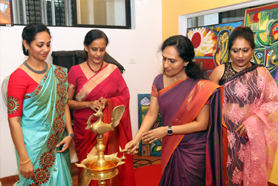 Sheela Kochouseph, MD of V-Star creations and a leading woman entrepreneur of Kerala. WeHuB is a meeting space where entrepreneurial women can create and collaborate in a professional,productive manner. The platform provides the members with connections to other business experts, access to educational workshops, and visibility within the community. Smt. 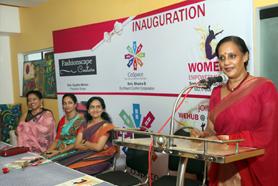 Sheela Kochouseph urged the need for such a forum which can really be of great boon to budding women entrepreneurs.Smt.Jasmine Siby Managing Trustee done the welcome speech and Smt.Susan Abraham the Chief Operating Officer had given the vote of thanks.